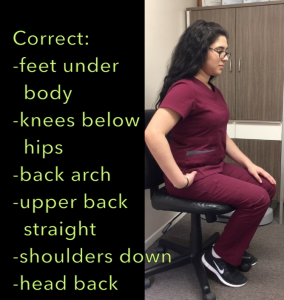 In this short video Dr. Ratkovic explains the best posture while sitting to limit the stress on our back. Sitting is the most used posture throughout the day. By understand the “how to” of proper positioning, you can keep limit back pain and hunching forward. Have the feet behind you and your knees below your hips keeps your back relaxed. This limits tension in your spine, and allow you to sit up easier. Being conscious of your shoulders and neck limits the hunchback posture too. So try this sitting posture checklist. After a few weeks consciously going through it, then hopefully your body can remember unconsciously so you keep your body’s posture well.